There’s a reason why Homer Simpson is in love with these things. Soft, warm and chewy, the doughnut has held the hearts of many North Americans since the early 19th century. And while it seems all types of baked goods have been having their heyday, the donut has been making a come back on the gourmet pastry scene (Hello, Cronut!). Paulette’s was our first real experience in the gourmet donut world. Sadly, they have recently decided to go to an order model – no more walk in treats. What’s a brunchosaurus to do? Taking in every last ray of sunshine we could get! 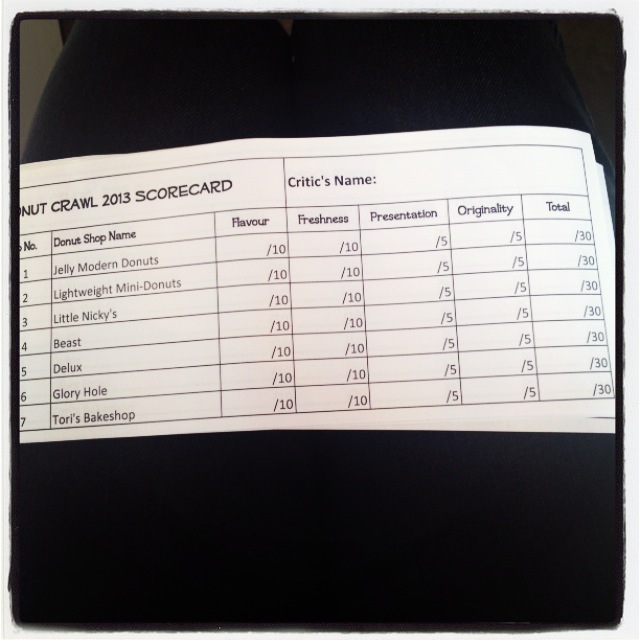 A Donut Crawl that’s what! 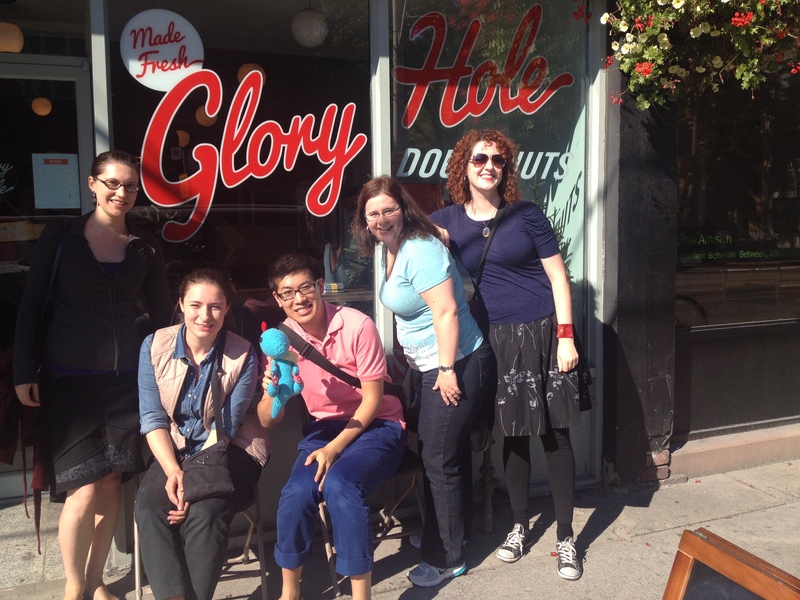 How did Toronto’s donuts fair? 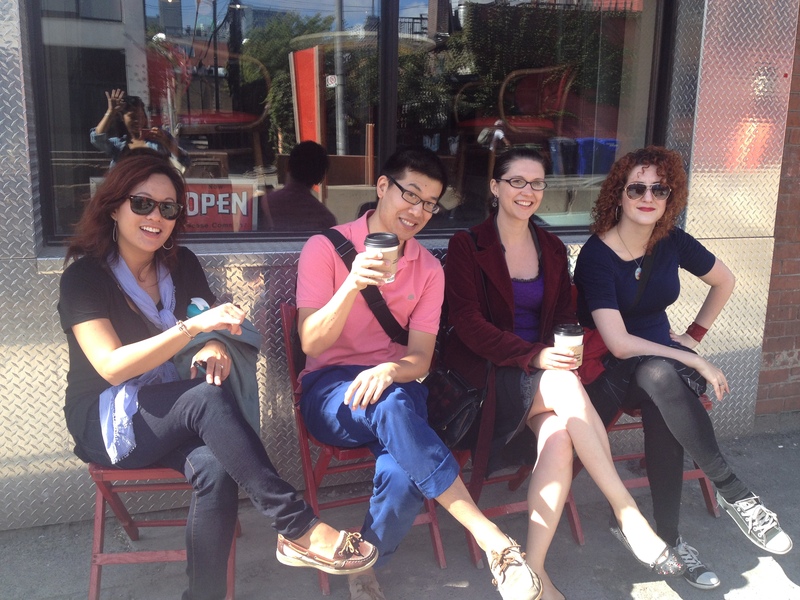 We sampled four out of the seven stops we had in mind. 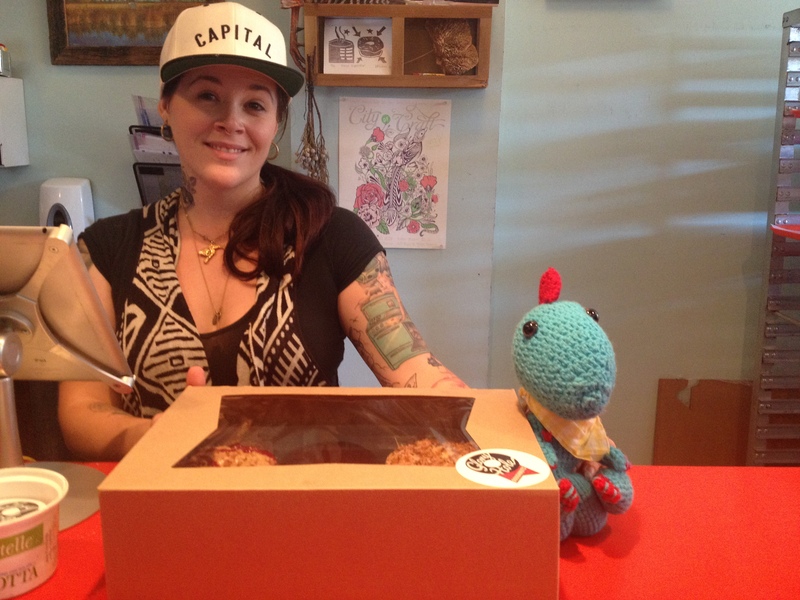 We’ll have to try Tori’s Bakeshop, Dough by Rachelle (through Beast Restaurant) and Lightweight Donuts another time! And how did Toronto do? 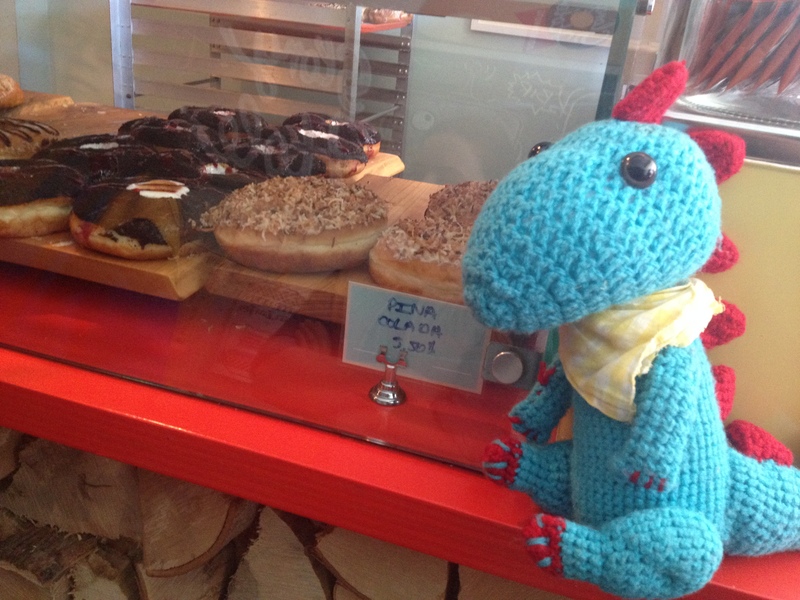 Benny can’t believe all these donuts! With two locations in Canada, Jelly Modern‘s mission is to make handcrafted sophisticated donuts and they’re doing a bang up job of it. These donuts are just so darm pretty! The group favourites had to be the surprise Carmel Apple. Not something we would have reached for over all other donuts but the flavours were well received. 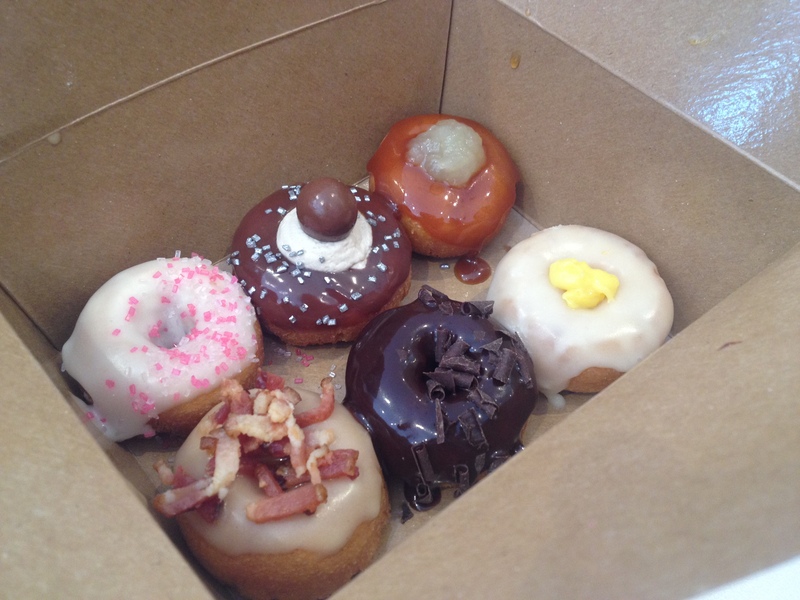 Special mention goes to the Gluten Free selection, specifically the Maple Bacon donut! One stop in and we were already full! 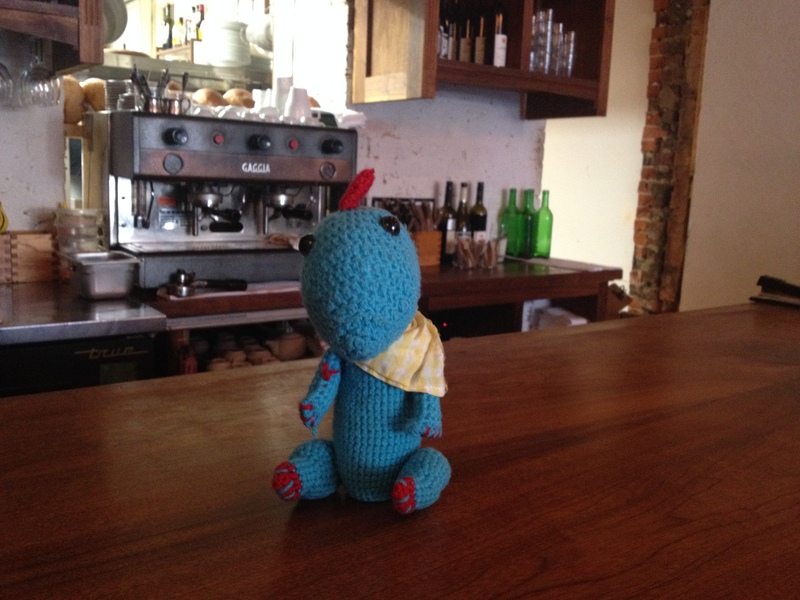 But onwards to our next stop on Hipster Queen Street, Little Nicky’s Coffee. 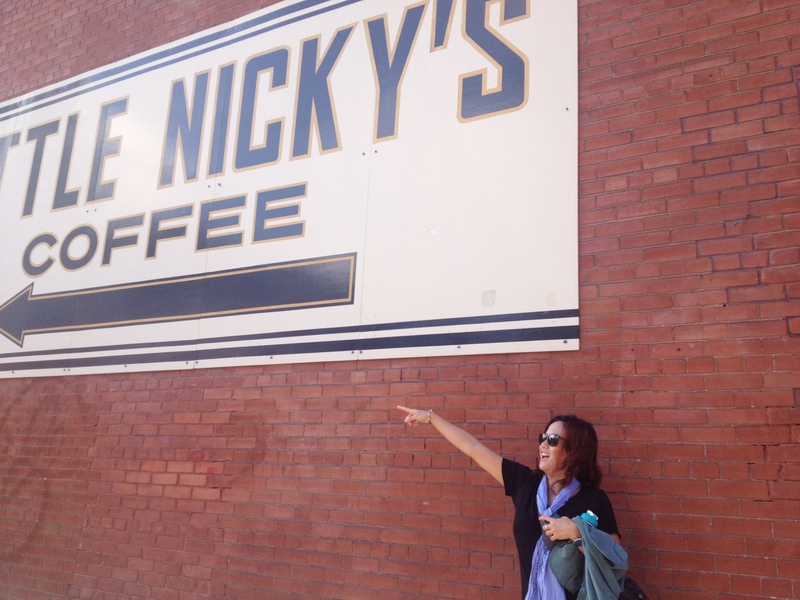 Little Nicky’s is that-a-way! Missy shows us where we need to head next! Little Nicky’s decided to up the ante by adding FRESH to the line up. Who doesn’t want to watch their donuts being made? 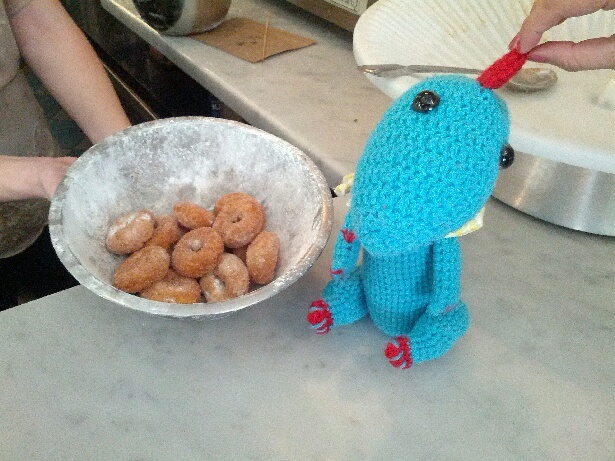 Their donuts were a little crispy on the outside and have a great texture. I could have eaten 50 of these bad boys! Missy got it just right “They understand what KISS means”. They know how to make a killer donut and don’t need any of the fancy frills to make it look or taste better. Benny can’t wait to get a taste of these, fresh off the conveyor belt! After two very different and excellent stops where would Toronto take us next? After a lengthy walking adventure we finally made it to Delux Restaurant. Benny is always at home near the coffee! 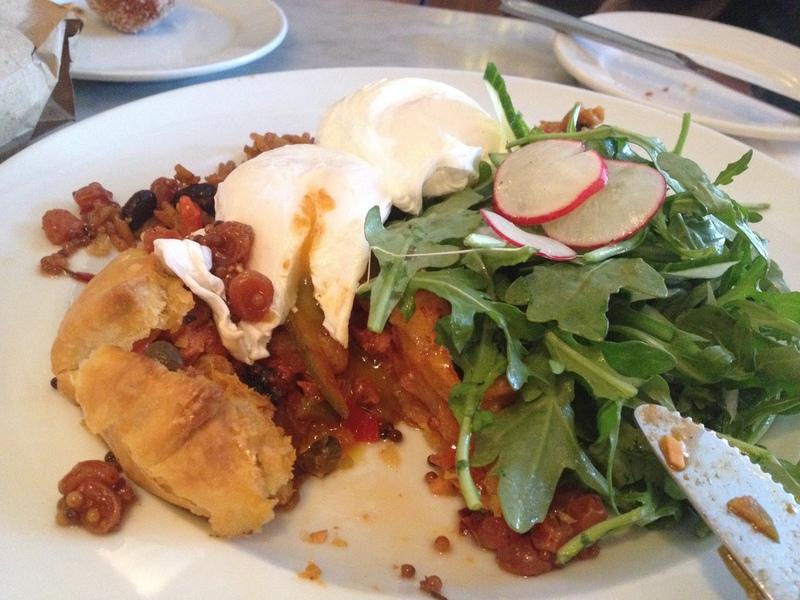 Savoury with our sweet: Delux’s chorizo empanada was delish! We will definitely be back for full brunch soon! But the true question of the day: How did their donuts fair? 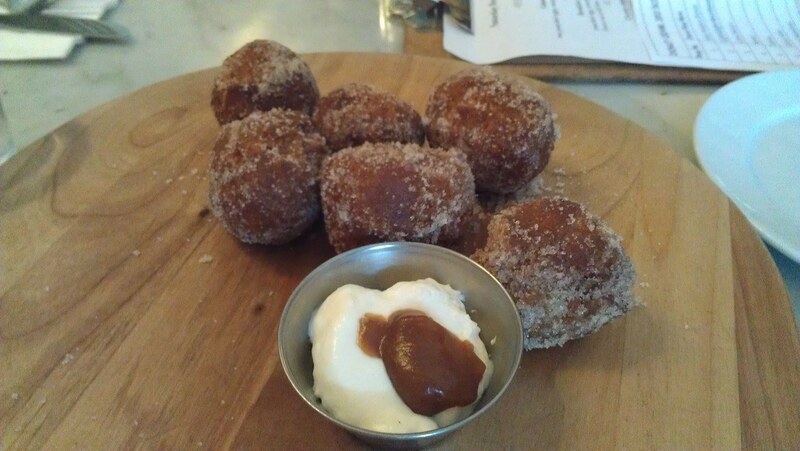 The only donut holes on our crawl, these were dense and made to order! This tasty treat is served with Chantilly Cream and Dulce de Leche for dipping which was a nice touch. Open a little over a year, GHD is the brain child of Ashley Jacot who we were happy to meet on our outing. Baked fresh every morning we got a final taste of their summer donut line. And we were blown away by all of her very creative flavour combinations: Boston Cream, Fluffer Nutter, Pina Colada, PB and J… just to name a few of her stellar combinations. Every bite was soft and chewy and GOOD. The Motherload! These donuts are huge! 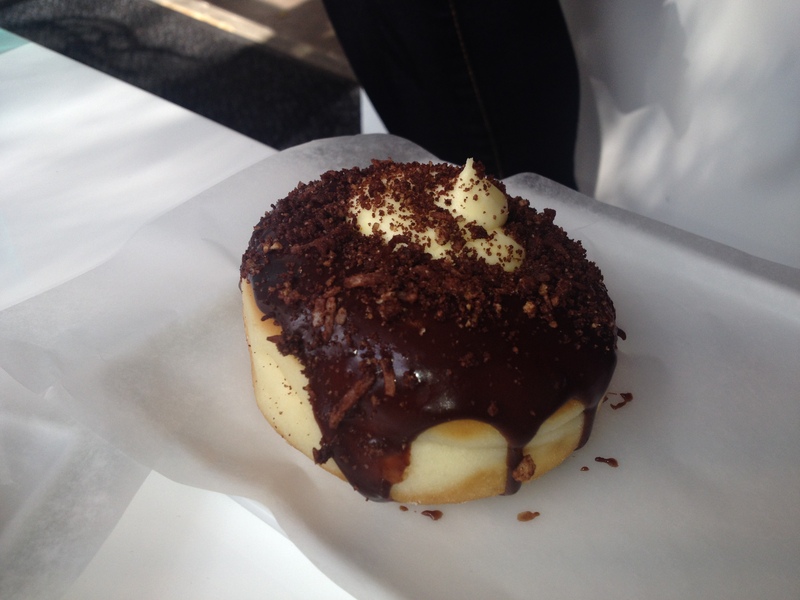 Honestly, GHD makes the best Boston Cream donut I have ever had hands down. 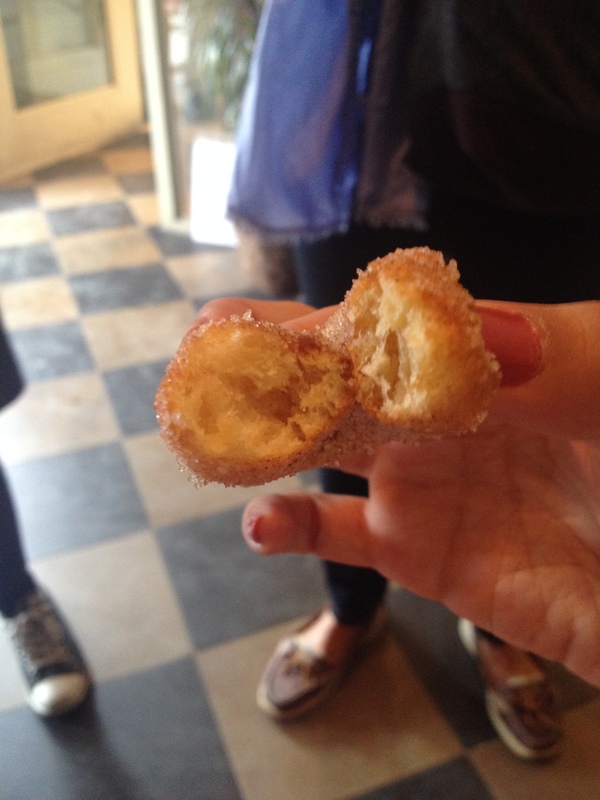 And the simple execution of their margarita glaze donut – you had me at Hello! So who won the day according to our donut aficionados? 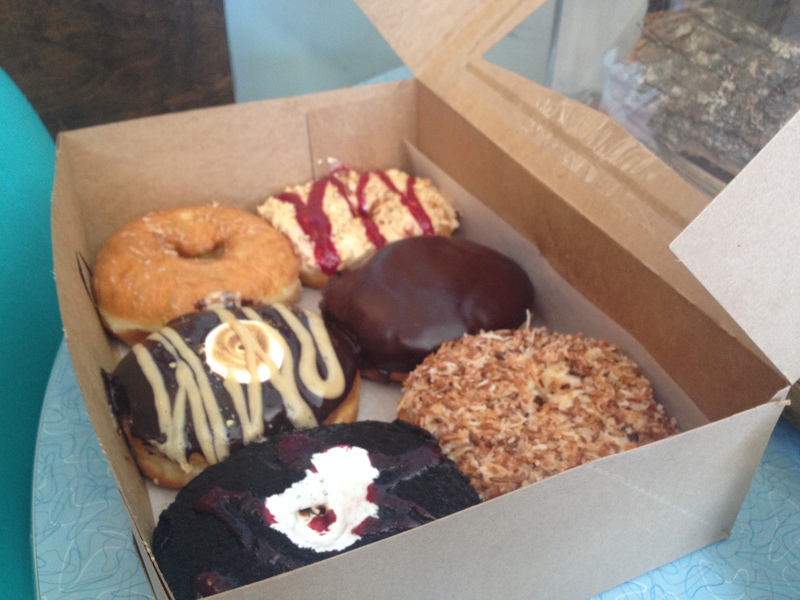 Little Nicky’s and Glory Hole Donuts! Glory Hole Doughnuts hit the right notes on flavour and originality and Little Nicky’s has the competition beat on freshness and presentation! More sunning in front of Glory Hole! 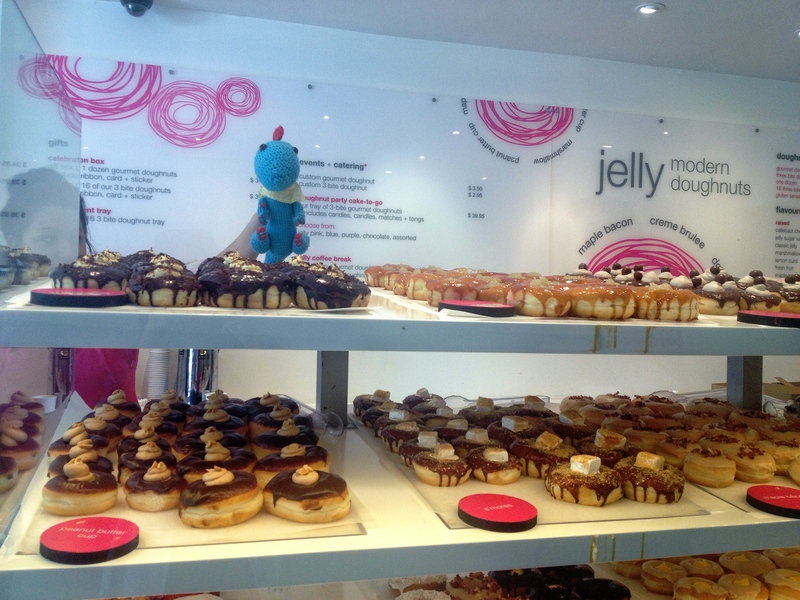 Click here for my twitter list of all the best donut places in Toronto including some of the ones we weren’t able to get to – warning their tweets will make you drool! And don’t forget to hit up one of these fine establishments! They’ll take good care of you!